I had never heard Dave Sterling’s music until this CD arrived in the mail. That's a little hard to believe because the man has plenty of talent when it comes to crafting enjoyable and easily accessible adult contemporary music. I would have expected him to appear on my radar screen before this. Better late than never, though. I’m glad his "blip" has finally registered on my monitor because this pianist/keyboardist has some mighty fine chops, both when it comes to his playing technique as well as his knack with catchy melodies and can't-get-them-out-of-your head hooks. Sterling doesn't always fly solo here, sometimes he's joined by other musicians, e.g. trumpet player Glenn Lambert on the opening peppy Dancing on the Rock which starts the album off in fine fashion, Sterling contributing some fancy work on the ivories here as well as an assortment of synthesized instruments, from drums to strings, et al. Most of Along the Curve contains upbeat and energetic music, perfect for cruising down a two-lane blacktop. More than once, the CD reminded me of David Arkenstone's outstanding Sketches from an American Journey (not meaning that Sterling is on Arkentsone's level, which is only natural since the latter is one of the giants in the new age/adult contemporary genre). What Along the Curve does share with Sketches... is a flair for drama and fun without over-reaching or hitting the listener over the head with too much "oomph". There are a few minor critiques I can mention. Stephanie’s Lullaby and its delicate melody seem like too abrupt and jarring of a segue coming after the powerful "Dancing on the Rock" and it also features some inferior sampled violins at the track's beginning (an oddity since later in the same song a real violinist, Nancy Messuri, is featured). Men of Honor, the next cut, is a nicely executed dramatic ode to the men and women of our armed services, with appropriate militaristic cadences on snare and tom tom drums and lively trumpet work (again by Lambert). However, while I appreciate the obvious sincerity of the artist's intent by including some narration from Ronald Reagan towards the end, I think it derails the track's flow and is superfluous. There is no need to underline and boldface the song's impact. The eight remaining tracks are all worthy of compliments, whether it's the dramatically uptempo Road to Freedom which displays Sterling's adroit use of synthesized percussion, bass and drums (he uses some great trap kit samples! ), the heart-on-the-sleeve romantic ballad (meant for his wife) When Lisa Smiles, the almost joyful jazz-inflected Sound Check, or the good-time shuffling Calvin’s Dance (on which I hear echoes of Mark Sloniker - definitely high praise from me). The title track concludes the album and it's here that Sterling pulls out all the stops, showcasing both his piano playing and assorted keyboard/drum programming skills to a high degree of artistry. After an opening prelude, the song hits its stride with some of the catchiest music on the CD, buoyed by a toe-tapping synth bass beat and subtle electronics, as well as delicious synth string applications. A show stopper of a tune, it's befitting someone of Yanni's stature and that's meant in the best possible connotation. 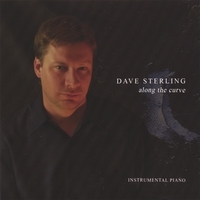 If you enjoy piano-centered ensemble adult contemporary music (although most of the "ensemble" is the artist himself), Dave Sterling's Along the Curve deserves your careful attention. Yeah, it's not perfect, but you don’t hear songs like the title track very often, and for that alone, I’d solidly recommend the CD. Nicely done, Dave!